In 2002, New Garden opened a facility in Winston-Salem to better serve our Forsyth county clientele. Several crews operate from our location on Blue Rock Court providing a full range of residential and business landscape services in Winston-Salem, including design and installation, landscape and garden maintenance and enhancement services, landscape lighting and irrigation installation and maintenance, and annual flower programs. New Garden Landscaping & Nursery is involved with the Winston-Salem community. Designer Jeanine Bennett serves on the Community Appearance Commission. Since 2008 we have been a Patron of the Women's Council of Forsyth Medical Center's annual Garden Party. New Garden offers full-service Landscape Design & Installation. Add or update foundation plantings, patios & walkways, retaining walls, or other landscape features. Your designer will match your vision and budget to a wide range of design solutions. Our goal is to develop a plan that unites you with your outdoor spaces. We can include low-voltage lighting and irrigation systems in any landscape design, add new to existing landscapes, and maintain or update your current system. Ask us about seasonal irrigation system start-up and shutdown. 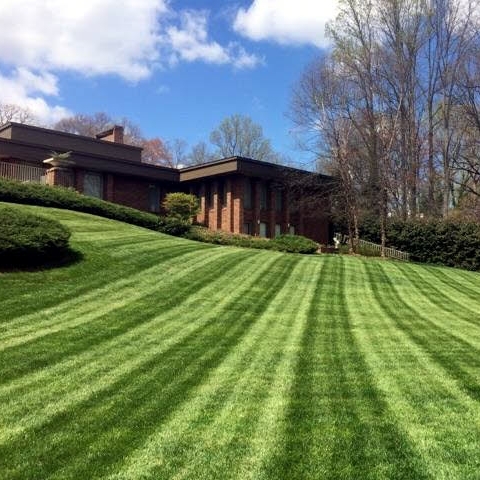 Our skilled teams provide a variety of services including turf and shrub management, seasonal flower and container programs, and customized maintenance packages that offer pruning, fertilization, mowing, edging and cleanup. After a consultation to determine your needs, we'll create a custom maintenance plan for your property to provide year-round services designed to keep your landscape healthy, beautiful and worry-free. If your outdoor spaces are rundown or overgrown, need a "tune up" or are looking under the weather and need a “get well”, our Garden Enhancement Teams have the horticultural experience necessary to make sure that plants are properly pruned for controlled growth, and they can help you avoid any disease or insect problems. We can get your property back on track with a one-time visit, leaving it ready for you to take over ongoing maintenance yourself. Or we can continue regular horticultural services if you don't have the time or confidence to perform regular maintenance yourself.